The Sandakan POW camp was destroyed a few months after the end of WW2, by the retreating Japanese troops. In No. 1 compound, graves containing the bodies of 300 Australian and British prisoners were later discovered. It is believed they were the men left at the camp after the second series of marches. Each grave contained several bodies, in some cases as many as 10. The Sandakan Death Marches were a series of forced marches from Sandakan to Ranau which resulted in the deaths of more than 3,600 Indonesian civilian slave labourers and 2,400 Allied prisoners of war held captive by the Empire of Japan during the Pacific campaign of World War II at prison camps in North Borneo . By the end of the war only 6 Australians survived of all the prisoners who had been incarcerated at Sandakan and Ranau. In 1942 and 1943, Indonesian civilians imported from Java , along with Australian and British POWs who had been captured at the Battle of Singapore in February 1942, were shipped to North Borneo in order to construct a military airstrip and POW camp at Sandakan , North Borneo ( Sabah ). As on the Burma Railway, the prisoners were forced to work at gunpoint, and were often beaten whilst receiving very little food or medical attention. In August 1943, with the intention of controlling the enlisted men by removing any commanders, most officer prisoners were moved from Sandakan to the Batu Lintang camp at Kuching . This action saved the lives of many officers so removed. Conditions for the remaining prisoners deteriorated sharply following the officers’ removal. Any rations given were further reduced, and sick prisoners were also forced to work on the airstrip . After construction was completed the prisoners initially remained at the camp. In January 1945, with only 1,900 prisoners still alive, the advancing Allies managed to successfully bomb and destroy the airfield. It was at this time with Allied landings anticipated shortly that camp commandant Captain Hoshijima Susumu decided to move the remaining prisoners westward into the mountains to the town of Ranau, a distance of approximately 260 kilometres (160 miles). He claimed that this was an order of Lt Gen Masao Baba, commanding officer of the 37th Japanese Army. The first phase of marches across wide marshland , dense jungle , and then up the eastern slope of Mount Kinabalu occurred between January and March 1945. The Japanese had selected 470 prisoners who were thought to be fit enough to carry baggage and supplies for the accompanying Japanese battalions relocating to the western coast. 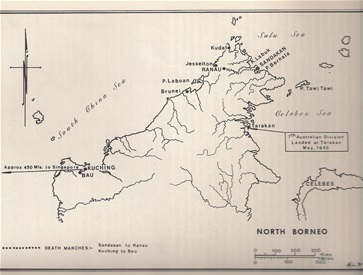 In several groups the POWs, all of whom were either malnourished or suffering serious illness, started the journey originally under the intention of reaching Jesselton ( Kota Kinabalu ). Although the route took nine days, they were given enough rations for only four days. As on the Bataan Death March , any POWs who were not fit enough or collapsed from exhaustion were either killed or left to die en route. Many were baynetted, and some begged for death. Upon reaching Ranau, the survivors were halted and ordered to construct a temporary camp. As one historian later commented: "Those who survived… were herded into insanitary and crowded huts and many died from dysentery. By 26 June, only five Australians and one British soldier were still alive." A second series of marches began on 29 May 1945 with approximately 536 prisoners. The new Sandakan camp commander, Captain Takakuwa Takuo, ordered the prisoners towards Ranau in groups of about fifty with accompanying Japanese guards. The march lasted for twenty-six days, with prisoners even less fit than those in the first marches had been, provided with fewer rations and often forced to forage for food. Compound No. 1 of the Sandakan camp was destroyed in an attempt to erase any evidence of its existence. Only 183 prisoners managed to reach Ranau. Upon their arrival on 24 June 1945, participants of the second marches discovered that only six prisoners from the first series of marches during January were still alive. Approximately 250 people were left at Sandakan after the second march departed. Most prisoners were so ill that the Japanese initially intended to let them starve to death . However on 9 June 1945 it was decided to send another group of 75 men on a final march. The remaining men were so weak that none survived beyond 50 kilometres (30 miles). As each POWcollapsed from exhaustion, he was shot by a Japanese guard. All remaining prisoners left at Sandakan who could not walk either were killed or died from a combination of starvation and sickness before, and/or in the following 3 weeks after the Japanese surrender on 15 August 1945. Due to a combination of a lack of food and brutal treatment at the hands of the Japanese, there were only 38 prisoners left alive at Ranau by the end of July1945. All were too unwell and weak to do any work, and it was ordered that any remaining survivors should be shot. They were killed by the guards during August, possibly up to 12 days after the end of the war on August 14. As previously mentioned, only six Australian servicemen managed to escape. During the marches, Gunner Owen Campbell and Bombardier Richard Braithwaite managed to escape into the jungle, where they were assisted by locals and eventually rescued by Allied units. During July 1945, Private Nelson Short, Warrant Officer William Sticpewich, Private Keith Botterill and Lance Bombardier William Moxham managed to escape from Ranau and were helped by local people, who fed them and hid them from the Japanese until the end of the war. Of the six survivors, only three survived the lingering effects of their ordeal in order to give evidence at various war crimes trials in both Tokyo and Rabaul . The world was able to receive eyewitness accounts of the crimes and atrocities committed. Captain Hoshijima was found guilty of war crimes and hanged on April 6 1946. Capt Takakuwa and his second-in-charge, Capt Watanabe Genzo, were found guilty of causing the murders and massacres of prisoners-of-war, and were hanged and shot on 6 April 1946 and 16 March 1946 respectively. A War Memorial and Gardens of remembrance were built at Kundasang , Sabah in 1962, and a Memorial Park has been created on the site of the Sandakan POW camp to commemorate those who had their lives unlawfully and unmercifully taken from them. The above events have been described as the worst atrocity ever committed by the Japanese Empire during World War Two. The Sandakan Death Marches have been dramatised in the 2004 play Sandakan Threnody — a threnody being a hymn of mourning, composed as a memorial to a dead person. The play was written by Australian composer Jonathan Mills, whose father survived a term of imprisonment at Sandakan in 1942-43. Australians must never forget the tragic circumstances of these events, ever ! 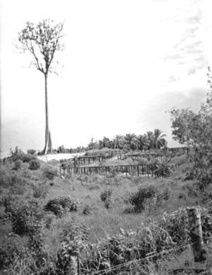 No 1 Compound, Sandakan ... photographed just after WW2 - Contained the bodies of 300 Australian & Brithish servicemen, with up to 10 bodies in each grave. Bill Young OAM - The age limit to join the AIF in 1939 was 20. By 1943, it would fall to 18. On 23JUL1941, Bill added a whopping 4 years to his age. His latest book entitled "Billy - My Life as a Teenage POW" written both by Bill and Lynette Silver AOM, reveals his story. After capture in Singapore in 1942, he was sent to Sandakan. Bill escaped, together with his mate,Jimmy Brown, but was quickly rounded up and sent to be interrogated by the dreaded Kempeitai. After about a month, he was sent to Kuching for trial, and then on to Outram Goal in Singapore. In comparison, some have said Changi Goal was heaven, and Bill Young survived to tell the tale. He is alive and well....Jan17. Whenever a word of them is spoken. Double click map to enlarge. Hi am writing to make contact with Family of Private Allan Clarence Quailey (Quailey's Hill). I am shocked to read of the terrible treatment our soldiers received.